Aquatic environments provide critical habitat to a wide variety of bird species . Some aquatic birds divide their time between aquatic and terrestrial environments, while others spend most of their lives in water, returning to land only to breed. Many familiar bird groups are aquatic, including gulls and penguins as well as recreationally important species such as ducks and geese. Wading birds occupy shallow-water habitats in both fresh-water and saltwater environments. They have long, thin legs that allow them to walk through water easily while keeping the rest of their bodies dry. Some wading species find food by stirring the water with their feet; others use their beaks to filter food. Larger species with long legs and great height also possess long flexible necks that allow them to reach food below the water surface. Well-known wading species include flamingos, cranes, herons, storks, and egrets. Smaller birds include sandpipers and plovers. 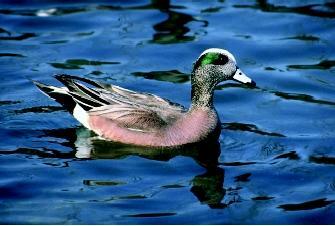 The American widgeon is a common marsh duck which spends much of its time in deep water. It is nicknamed "bald pate" because the male has a white stripe on its head. and other underwater prey. Well-known diving birds include ducks, geese, swans, pelicans, and penguins. These highly aquatic birds have evolved special adaptations to their habitat, such as webbed feet for swimming and waterproof feathers. Salt-water species also possess special salt glands that help excrete the excess salt that results from drinking sea water. Diving birds associated with marine habitats also are called seabirds. Many seabirds spend large portions of time far from land, and all obtain food from the sea. However, all species return to land to lay eggs. In some places, seabirds can occur in staggering numbers—off the coast of Newfoundland, for example, some 35 to 40 million seabirds are documented yearly. Large breeding colonies of colorful puffins, as well as murres, stormpetrels, and other species attract numerous tourists in the spring. Penguins are perhaps the most aquatic of all diving birds. * In some species, individuals return to land only to breed and molt. Like marine mammals, penguins that dive underwater must return to the water surface to breathe. Many penguins feed on krill (a small, shrimp-like crustacean), though some species hunt larger prey such as squid and fish. Penguins possess a streamlined body and are well-adapted to underwater swimming, achieving speeds as great as 15 kilometers (9 miles) per hour. A specialized fat layer and dense, waterproof feathers help them maintain appropriate body temperatures in frigid Antarctic waters. Penguin wings have been modified through evolution to form paddle-like flippers. Penguins are often described as "flying through water" because their wing motions during swimming resemble those of flying birds. Aquatic bird species are at risk on many fronts. Many have declined due to the large-scale loss of wetland habitats. One example is the whooping crane, which was reduced to fewer than twenty individuals in the 1930s due to habitat loss and hunting. Though still highly endangered , whooping cranes have recovered somewhat as a result of massive conservation efforts involving habitat protection, captive breeding, and the release of captively bred populations into the wild. Other aquatic bird species are directly put at risk by human activity. Albatrosses, oceanic seabirds known for their large size and ability to fly long distances, have greatly declined in recent years due to the practice of longline fishing. Longlines (fishing lines with a single main line attached to secondary lines with baited hooks) kill over 40,000 albatrosses yearly. Nearly every albatross species is now critically imperiled. Global warming appears to have impacted many species of Arctic and Antarctic aquatic birds. The loss of tundra breeding grounds in the Arctic has resulted in the decline of geese and sandpiper species. Several species of penguins also appear to be in decline, possibly due to krill shortages, some occurrences of which may be linked to global warming. Oil spills represent a major threat to aquatic birds. One of the most infamous spills occurred in 1989, when the Exxon Valdez released 11 million tons of crude oil into Prince William Sound in Alaska. Thousands of seabirds died immediately upon contacting the oil, which destroys the insulating capacity of feathers. Others died from ingesting lethal amounts of oil when they tried to clean themselves. U.S. Fish and Wildlife Service biologists estimated that between 250,000 and 400,000 seabirds died as a result of the spill. Aquatic birds are good indicators of the health of the habitats they occupy, and conservation efforts on their behalf have benefited ecosystems as well as other species. The first National Wildlife Refuge was established in Florida by President Theodore Roosevelt for an aquatic bird, the brown pelican, in 1903. SEE ALSO Endangered Species Act ; Fish and Wildlife Service, U.S. ; Oil Spills: Impact on the Ocean ; Pollution by Invasive Species . Enticott, Jim, and David Tipling. Photographic Handbook of the Seabirds of the World . London, U.K.: New Holland, 1998. Gill, Frank B. Ornithology . New York: W. H. Freeman, 1995. Haley, Delphine. Seabirds of Eastern North Pacific and Arctic Waters . Seattle, WA: Pacific Search Press, 1984. Harrison, Craig S. Seabirds of Hawaii: Natural History and Conservation . Ithaca, NY: Comstock Publishing Associates, 1990. Nelson, Bryan Seabirds: Their Biology and Ecology . New York: A & W Publishers Inc., 1979. Terres, John K. The Audubon Society Encyclopedia of North American Birds . New York: Knopf, 1980. Some aquatic birds have been so successful at coexisting with humans that they occur in high densities and become nuisance species. For example, gulls thrive in many urban areas by feeding on garbage. The Canada goose is another aggressive nuisance species that outcompetes other aquatic birds for nesting space. Mute swans are an invasive species that compete with native waterbirds for nesting sites and food. Nuisance species can degrade human habitats through their large numbers and excessive droppings in public areas. They may also eat crops or overgraze pastures. In some cases, nuisance species create significant public health problems. Control measures include limiting food supplies or destroying eggs before they can hatch. * See "Oceans, Polar" for a photograph of an adelie penguin.